So, we’re all set up at the Book Arts Fair! Now would be a great time to do a quick refresher read on our Printmaking 101 introduction to bookbinding post, and then head on over to the preview party 7-9 pm tonight! Additionally, congratulations to Yolanda for her well-deserved press coverage in the Gazette of her current show! You can read the article at the link. Yay! The Book Arts Fair is just over a week away! Do you have your tickets yet? We’ll have some great books by Martha Oatway, Rosemary Cooley, Carole Nelson, and more! Here’s a few images to get you excited. See you at the Book Arts Fair next week! We’re super excited for Line – Structure – Pattern in the Press Room next month! 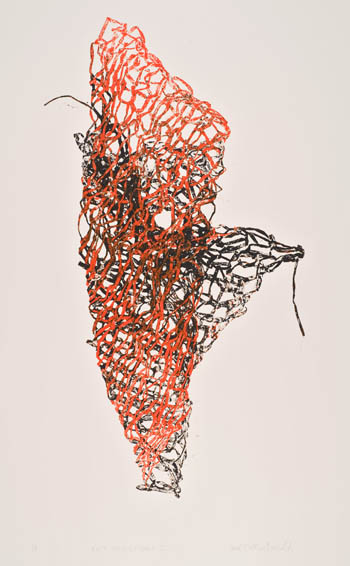 Vermont printmaker/knitter Carol MacDonald will install recent prints that are inspired by her other creative passion, knitting. These looped and coiled, tangled and reorganized images explore the role of process, repetition and the essential elements found in our daily lives and the natural world. Can’t catch Carol at WPG? She’ll also be at the Art at the Coach Barn (Shelburne, VT) now through November 4 and the Parallax Art Fairs (NYC- November 17 and 18 and Miami December 7-9). Yolanda Frederikse has just announced an artist-led tour of her upcoming solo exhibition, Before and After the Derecho. This tour will be at 2:30 pm on Sunday, November 11. If you can’t come to the November 3 opening (or even if you can), this is a great time to hear more about work from the artist herself. 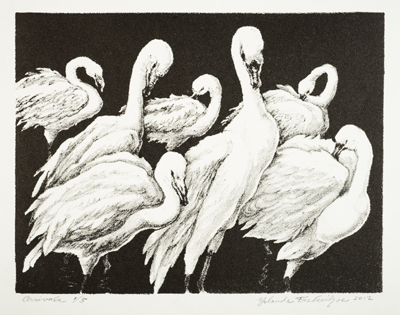 In addition, four of the 5 artists in the upcoming Maryland Hall exhibition, Connections, are WPG artists-Deron DeCesare, Ed McCluney, Ron Meick, and Margaret Adams Parker (good friend Mary Ott is the 5th printmaker). This exhibition showcases printmakers that also work in other media (painting or sculpture). The opening reception is the day after Yolanda’s, Sunday, November 4, 2-4 pm, in the Chaney Gallery (Maryland Hall for Creative Arts, Annapolis, MD). Finally, don’t forget to buy your tickets to the Pyramid Atlantic Book Arts Fair! This biennial festival will be held November 16-18. Several of the lectures will be held at Washington Printmakers Gallery, and we’ll have a special booth at the vendor’s fair. WPG is excited to have two special Press Room Exhibitions in addition to our regularly scheduled October and November member and solo artist shows. In October, mark your calendars for Both Sides of The Brain, a travelling mezzotint portfolio, in the Press Room and Deron DeCesare’s Old World and New: Apart though still a Part. The Opening Reception for both these shows (and the membership exhibition) is Saturday, October 6 ,1-4 pm. In November we have Before and After the Derecho, a solo exhibition by Yolanda Frederikse in the main space, and Carol MacDonald’s Line – Structure – Pattern in the Press Room. The Opening Reception for these exhibition is Saturday, November 4, 1-4 pm. In addition to our events, there are two fairs we’ve probably mentioned, but it doesn’t hurt to mention them again. First, is the 2nd ever (e)merge Art Fair, put on by the WPA. This fair focuses on under-represented artists and galleries “with an an energetic environment of collaboration and discovery.” This fair takes place at the Capitol Skyline Hotel in SW DC, October 4-7. Later, in November, there is the Pyramid Atlantic Book Arts Fair. WPG will have a booth, and the full list of vendors is now online at their website. 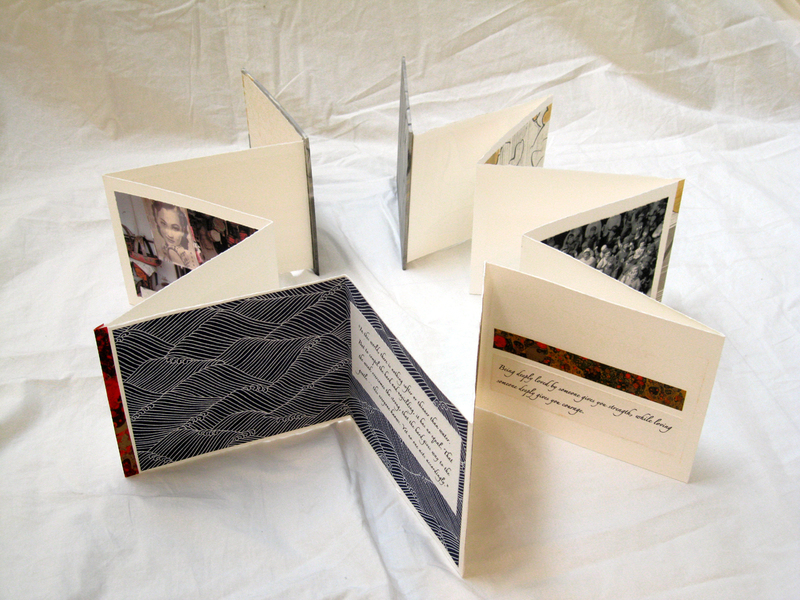 Check it out, get excited, and come to the Book Arts Fair November 16-18, 2012. Finally, looking forward to the Winter season, Maryland artist members of WPG will join their mentors (or artists to whom they have been mentors) for Mentor/Mentee II at the Brentwood Arts Exchange. More details to follow, but know that the exhibition will run December 3-January 26 and the Opening Reception is Friday, December 7, 6-9 pm.